Are spring allergies coming on early this year? Spring allergy season is blowing in early in many parts of the U.S. this year, with certain areas reporting pollen increases a good month sooner than usual. To avoid the sneezing, itching and wheezing, get a jump on treatments early, allergy experts told CBS News. Climate change is part of what's driving more sniffles, drippy eyes and asthma-related allergy symptoms ahead of the typical spring pollen season, said Dr. Anthony Montanaro, head of the Division of Allergy and Clinical Immunology at Oregon Health & Science University. A city or town's local topography and weather and the number of trees and plants in the area can play a role, too. Seasonal allergies are typically divvied up by season: Spring is tree pollen time, late spring and summer mean more grass and flower pollens, and by fall, ragweed and other plants are producing pollen. But warmer weather year round, and erratic temperatures, are shifting pollen patterns, and allergists are seeing patients' needs changing. In Oregon this year, Montanaro said, "We had a number of days in January where we had high tree pollen counts, where we'd never seen that in the past. We've recorded this for well over 50 years and we never see tree pollens until February." And it's not just his state. Montanaro said, "Nationally, there's been no question that people are having year-round symptoms who never had them before and people are getting earlier symptoms." He said friends in Atlanta told him they had the highest pollen counts they had ever seen in the wintertime this year. Right now, pollen counts for the U.S. are highest in Las Vegas, Baltimore, Washington, D.C., Cincinnati, Dallas and parts of North Carolina and Pennsylvania, according to weather.com. Warmer temperatures can be a factor, along with more trees or windier conditions lifting pollens off trees and helping them travel. "When you have a higher air temperature, it favors aerosolization of pollen. Instead of being in the plants, it's in the air," said Montanaro. Pollen counts may also have to do with rainfall, which washes pollen away in the moment, temporarily relieving symptoms, but helps trees grow and produce more pollen in the long run. "The level of the pollen depends on many, many factors," said Dr. Blanka Kaplan, who specializes in adult and pediatric allergy, asthma and clinical immunology at Northwell Health, in Great Neck, New York. Mold allergies are part of the seasonal allergy picture, too. They're tiny fungi that can live almost anywhere -- soil, plants, rotting wood. When temperatures go up in springtime, so do mold spore counts. Similar to pollen, their spores float in the air. They tend to peak in July in warmer states and October in the cooler states, but in the South and on the West Coast, they can be found year-round. 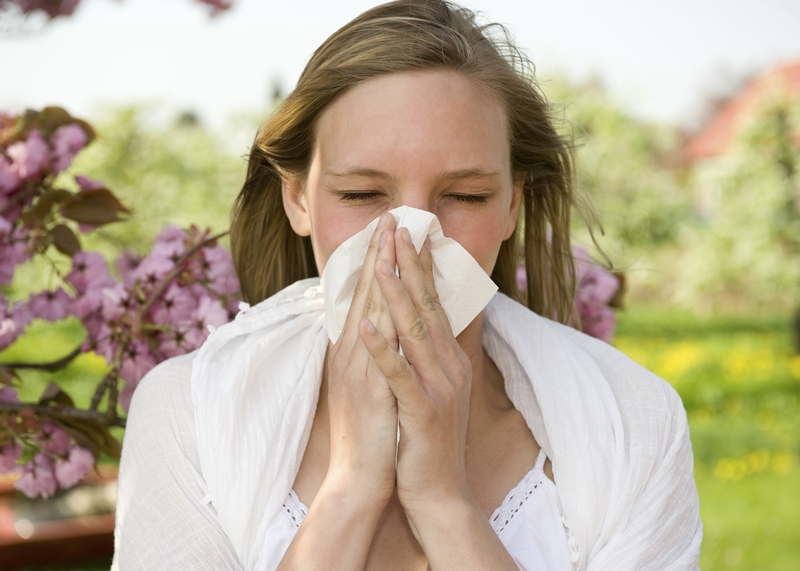 Seasonal allergies are also sometimes called allergic rhinitis or hay fever, and they affect millions. According to the U.S. Centers for Disease Control and Prevention, 19.1 million adults and 6.1 million children have hay fever. Symptoms can range from sneezing, stuffiness, and a runny nose to itchiness in your nose, the roof of your mouth, throat, eyes or ears. They happen when the immune system thinks pollen is an invader. Your immune system tries to fight off the enemy and overreacts by making antibodies called Immunoglobulin E (IgE). IgE antibodies travel to cells that release chemicals that cause the allergic reaction. Severity of symptoms varies from person to person. "Two things really define an allergic reaction: genetics and environment. We're still working hard to find out how genetics and environment play together," Kaplan said. She said environmental allergens like tree pollens are also "a huge trigger for asthma, too." "Treatment of pollen allergies is always best when it's done early," said Dr. Hey Chong, an assistant professor of pediatrics at the University of Pittsburgh and an allergist/immunologist at Children's Hospital of Pittsburgh. "We usually suggest to our patients as part of their management to look at pollen counts for their area. If you wait until you have a lot of symptoms, and wait to take your medications, then they're not as effective." For example, Chong said over-the-counter nasal steroid sprays can be very effective in treating stuffy, drippy noses due to allergies, and are best started one to two weeks ahead of symptoms. Dosing is usually from one to two sprays a day, but your doctor or allergist can help you figure out the best dose. "Nasal steroids are actually the most effective medication for environmental allergies. But because it's a steroid -- a very low dose steroid -- talk with a doctor about it," she said. "Generally it's very safe but because it is a steroid, especially when it comes to use in children, you should talk to a doctor," said Chong, noting that one study by colleagues at Pittsburgh suggested that its use is linked with a "very modest" affect on height. Over-the-counter allergy pills containing long-acting antihistamines are very effective in treating seasonal allergy symptoms, too, including those with fexofenadine and cetirizine. They work by blocking the action of histamine, the substance in the body that causes allergic symptoms. Eye drops for itchy, red eyes can ease symptoms, too. Immunotherapy, including allergy shots and sublingual tablets (which melt under the tongue), can especially help people with year-round seasonal allergies or those who don't do well on medicines, said Chong. The sublingual tablets are only available for grass and ragweed allergies at this time. People with allergies and asthma, including outdoor athletes, can also talk with their primary care physician or allergy and asthma specialists about asthma medications, such as a rescue inhaler when breathing becomes a struggle. Asthma drugs are not available over the counter, noted Kaplan. Non-drug strategies -- called avoidance methods -- that can help minimize symptoms include staying indoors during peak pollen times in an air conditioned location, and showering before climbing into bed at night. "Shower at night instead of morning so you don't get your bed contaminated with pollen. For kids with lots of eye symptoms, they should wash their hands when they've been outside a lot, so they don't rub pollen in their eyes," said Chong. For people who are extremely allergic and for whom medicines don't help control symptoms well enough, Chong advises skipping outdoor workouts during peak pollen days, especially if allergies kick up asthma symptoms. She also recommends allergy testing so that people know exactly which plants and allergens are their "triggers." "You can create a game plan where you're prepared ahead of time to start treatments before the symptoms start," Chong said.